I have an account, from way back called Pure L00ts. It was a looter, who's a level 3 that stands on top of people's deaths in the old wilderness and hopes that the person who killed them gets "PJed" or just doesn't pick up their drops. I have more items but can't be bothered posting them as they are less notable. I used to have 20 rune scimitars and 61 amulets of strength but I sold them. At the moment, I am mainly using this account to give money to my brother's poor pkers as an extra 5k is always nice. 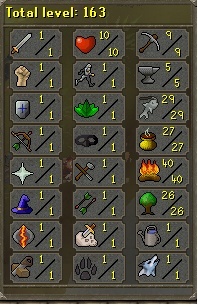 At one point I transferred 400k to my main from it(before Jagex cared), by giving my brother 600k and let him keep 200k which greatly helped it get to where it is now. Now, the question is, what should I do with this account? I plan on making my main a member again but I can't at the moment and am bored. This account also used to be a member on funorb.